Situated on Florida’s south-eastern coast, Fort Lauderdale is the perfect destination for a beach holiday. This scenic city has over 176,000 residents, and contributes towards the state’s reputation as a coastal paradise. Fort Lauderdale offers you a laidback time to enjoy its many sights and sounds. Popular attractions include Las Olas Boulevard, Bonnet House and Fort Lauderdale Beach. Treat yourself to this alluring American destination, because cheap flights to Fort Lauderdale are now available for a limited time! Fort Lauderdale is home to Fort Lauderdale-Hollywood International Airport (FLL), a 5-minute drive or a relaxing 35-minute train ride from the city centre. 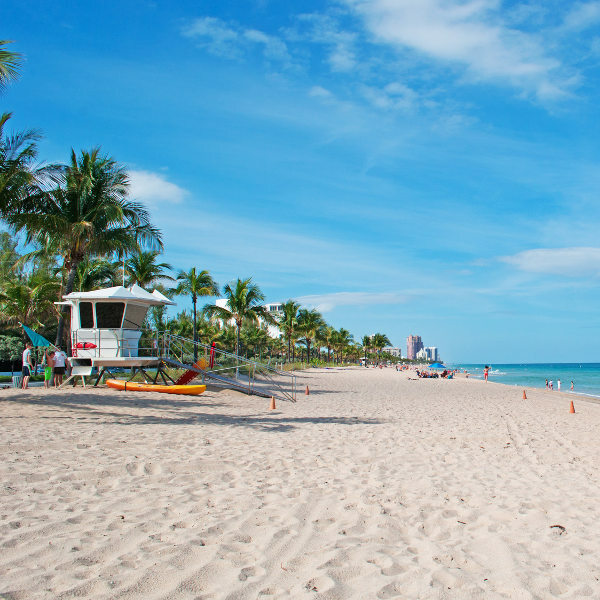 The star attraction of this American city is, by far, Fort Lauderdale Beach. Allow yourself the pleasure of relaxing on golden sands, under the sweet Florida sun, and browsing the chic stores and enticing restaurants at the nearby Las Olas Boulevard. Before the 1980s, Fort Lauderdale was just the place for hordes of college students during spring break. Today, elements of that lifestyle have been confined to the night clubs and bars of the city. Throw yourself into the crazy celebrations at these vibrant establishments. 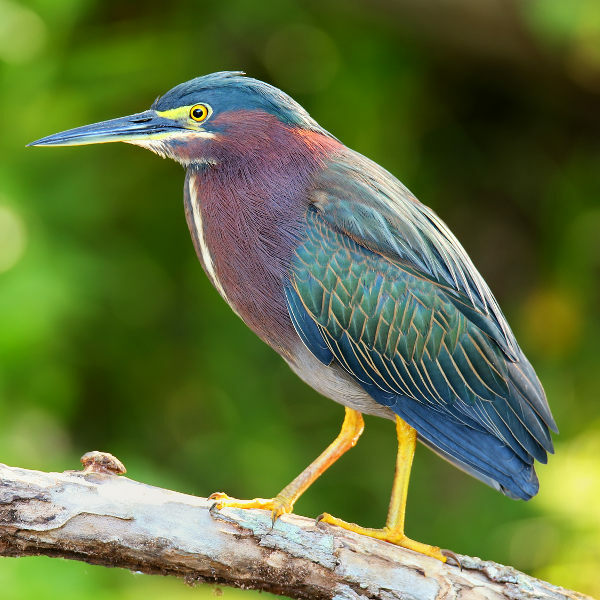 Like most destinations in Florida, Fort Lauderdale offers you the delight of access to beautiful parks and scenic reserves, which are home to a variety of cute, charming and exotic animals! You should consider the most popular time to visit Fort Lauderdale, even though it sits in the peak season. December to April (the dry season) brings 16-28°C temperatures and the lowest volume of rain, making it ideal for skipping the oppressive heat of the summer (May – November), which is the wet season. While it will definitely bring the most tourists and fewer hotel deals, make sure you book well in advance to ensure you get an accommodation offer that suits you best. 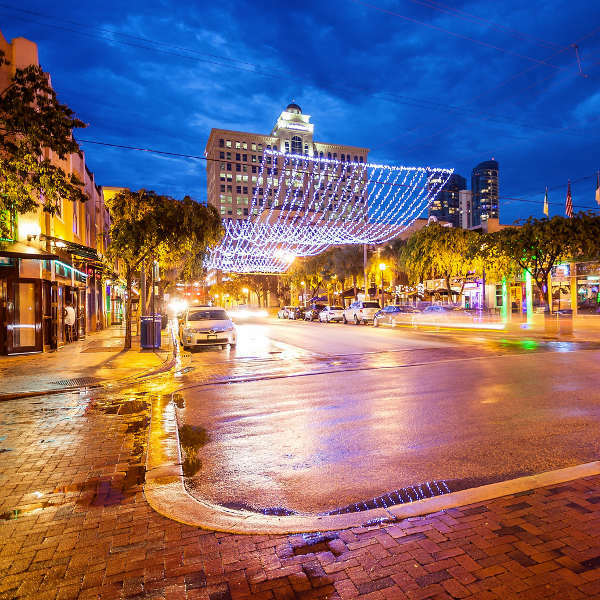 During this period, you can enjoy events such as the Winterfest Boat Parade (December) and the Las Olas Art Fair (January). If you’re willing to brave the wet season, consider visiting during May (when the rain will only begin to increase significantly) and November (when the rains are beginning to recede). The weather may be unpleasant at times, but you’ll be sure to get the best hotel deals. Make sure to bring clothing that suits this hot and wet season. Festivals and shows to experience during this time include Pride Fort Lauderdale (October) and the Fort Lauderdale International Film Festival (November). Get ready to visit one of the best holiday destinations in the world – Fort Lauderdale. This coastal destination in the ‘Sunshine State’ of Florida, is best known for its stunning beaches, energetic nightlife and the selection of stylish shops and boutiques. Start the day off perusing the variety of products at a range of establishments on Las Olas Boulevard. This road, essentially the centre of all the activity in Fort Lauderdale, stretches from the beach at Fort Lauderdale Boulevard all the way into the heart of the city. When you’ve done all your shopping, rest your legs at the many trendy cafés and restaurants situated along the boulevard, treating your taste buds to refreshing beverages and delectable cuisine. For a change of pace, rejuvenate your senses by spending time exploring the scenic locations around this destination, such as the Holiday Park, George English Park and Lauderdale Memorial Gardens. A convenient 25-minute drive to the west will lead you to the magnificent Everglades, the home of stunning landscapes, gorgeous vegetation and rare and endangered animals. When all you want to do is simply relax, soak up the sun at the collection of beaches around Fort Lauderdale, such as Fort Lauderdale Beach, Hillsboro Beach and Pompano Beach. Many of these venues offer so much more, however, with ski parks, outdoor sports (such as volleyball), beachfront eateries, and even opportunities for watching turtles as they nest! Compare several airlines and book your cheap flights to Fort Lauderdale online at Travelstart. Before heading out to explore what Fort Lauderdale has to offer, check with the hotel staff on what are the safest areas. The main tourist areas, such as the beaches, Las Olas Boulevard and downtown enjoy a high level of safety. Be careful, however, if you head more to the western, north-western and southwestern areas if Fort Lauderdale. Thieves tend to watch for rental cars, as these are popular modes of transport for tourists. Make sure you leave any purchases and valuables in the trunk/boot (move them before departing to avoid becoming a target).